New Delhi: The Congress in Punjab, led by Captain Amarinder Singh, is set to return to power after a gap of a decade, decimating on its way the ruling Akalis and dashing the hopes of newbie Aam Aadmi Party (AAP). Congress' candidates have won or are leading in 76 seats in the 117-member Punjab Assembly. Prominent among them is Navjot Singh Sidhu, who quit the BJP to join the Congress before the elections and contested from Amritsar East. He credited his victory to Congress vice-president Rahul Gandhi. The Arvind Kejriwal-led AAP, which many expected to win the state, managed to bag just 23 seats, but scored better than the Shiromani Akali Dal (SAD)-Bharatiya Janata Party (BJP) alliance, which has won only 18 seats. Akali Dal president Sukhbir Singh Badal has won the Jalalabad assembly seat with a margin of 18,500 votes defeating AAP's Punjab poster boy Bhagwant Mann. 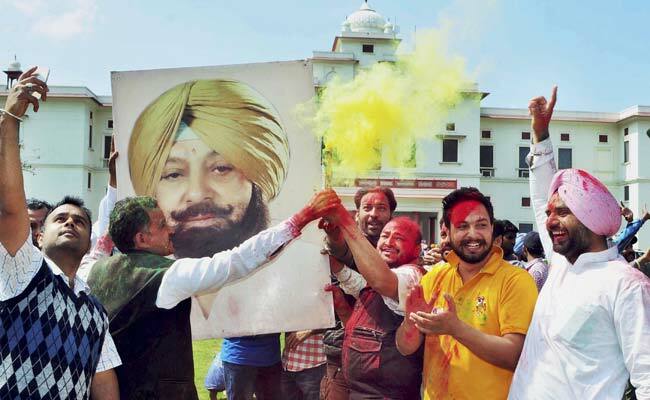 Congress' Amarinder Singh, who will be Chief Minister, won the Patiala seat - his home turf - defeating AAP's Balbir Singh by a massive 52,407 votes. But he lost, Lambi, the other seat he contested to outgoing chief minister Parkash Singh Badal. The other big winner from the Congress is Badal family rebel Manpreet Singh Badal from Bathinda Urban, bagging 63,942 votes.